Show your style with this rugged, practical, high performance bicycle light that keeps you visible in all weather conditions. Includes 10 LEDs and 19 themes. Dimensions: Light: 5.3" x 2.1" x 0.4"; Battery Holder: 3.3" x 2" x 1.5"
I'll let you know if they are a big hit in Europe, biking is big over there, it should be an awesome birthday gift. Hit with the grand kids. I purchased this for my granddaughters bikes and they absolutely loved it. I installed this on the rear wheels of their bikes and it was such a big hit I purchased the 232 for the front wheels and will install that on their bikes this weekend. I've been using these lights for several years and have the small size on my "fast" bike but the larger size on my "beast" bike (used in all seasons, for commuting). They are *extremely* bright--visible very clearly, even in daylight. Not only do they give your bike a wow factor, I find them an asset for bike safety. Trust me, cars notice these! -Lights have a bright mode and a super bright mode. -Small size fits even kids bikes/small wheels. wonderful , fun lights. Bought for my 12 year old grandson who says "now I can be seen anywhere any time". When riding your bike at dusk or in the dark, it’s important to make sure you can be seen. 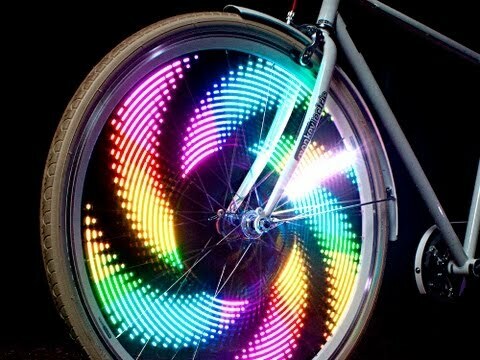 MonkeyLectric helps you stand out in style by digitally displaying bright, colorful lights and designs with every turn of your wheels. Made in California and created by founder Dan Goldwater and his team of talented electronic artists, these brilliant Technicolor patterns add 8-bit arcade-like graphics to your ride for a look that's sure to turn heads and bring smiles anywhere you go. The M232 features 32 ultra-bright full-color LEDs, 48 themes and hundreds of eye-catching color combinations to choose from. Also available, the M210 comes equipped with 10 ultra-bright full-color LEDs. When the folks at MonkeyLectric aren’t creating new designs, they’re out riding their bikes. So, it’s no surprise that these lights are engineered to withstand whatever the road holds. MonkeyLectric products are waterproof and built to resist cracking, scratching, and clouding. 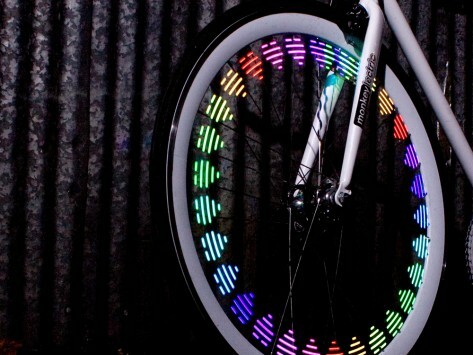 Strap MonkeyLectric to your bike wheels and let the light show begin.